I just dropped the kids off at their grandparents for the week. And I may have done a little happy dance inside. A bit of time off from parenting duties? Please and thank you! 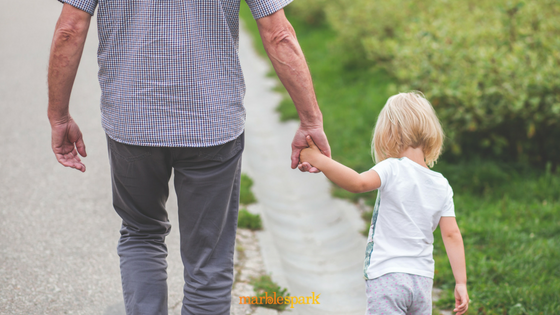 Selfish reasons aside, our kids look forward every summer to spending a week with their grandparents. And from what I’m told, the grandparents look forward to it, too. It started when our oldest (who is now 12) was four years old. My in-laws asked if he would want to do a golf/tennis/swim morning camp for a week in the summer where they live. A chance to spend some one-on-one time with Nana and Opa? And stay overnight for four nights in a row? He said sign me up! And that was the beginning of a summer tradition. Now all three of our sons go each summer and make memories. They’ll play games like Peek-or-No Peek, go swimming or to the park in the afternoons, play pinball in the basement, build with their dad’s old Legos and likely watch more TV than allowed at home. And the list goes on! I used to accompany the kids for a few of the days when they were younger, but now they get upset if I come along. I’d like to think it’s because they want to give me a break, but I know it’s that they can get away with more if mom isn’t around! Now our 12-year old is too old to attend the morning camp, so the question arose as to whether he’d still go this year. I was delighted when he said, “Of course I still want to go.” I don’t know how many more years he’ll think hanging out with his grandparents is cool! Both my husband and I had close relationships with our grandparents from childhood through adulthood. Though we didn’t have a summer tradition like my kids do of staying a week away, we have many memories of spending time with them. I remember going to grandma’s after church every Sunday for her famous monkey bread. It was the best around. I’ve tried making it, but it never comes close to her perfection. It was made with grandma’s love. And I remember my grandpa yelling at me (lovingly) during my basketball games, “Get off your feet!” I actually did once and scored 20 points! Maybe he did know a thing or two. Ha! They were always there to support, guide and cheer us on. Our grandparents had a part in shaping who we are today and are a link to our past, to our roots. Even though we don’t live in the same cities as our parents, we’ve always tried to make time for our kids and our parents to spend time together. Whether you live near or far, there are many ways to connect kids with their grandparents. Your kids can call on the phone or write a letter. In the digital age we live in, try Skype or help your kids write an email from your account. Go visit if you can. Take a trip together. The kids will be home in a few days. I’ll be excited to see them. It is eerie with the house so quiet. But that is another story for another post! They’ll be buzzing with stories (I’m sure a few of which they’ll keep to themselves). Most importantly, they’ll have memories of spending a week in the summer with Nana and Opa. The grandparents will enjoy the peace and quiet once more. And have lots of stories and memories (hopefully good ones) of their own.